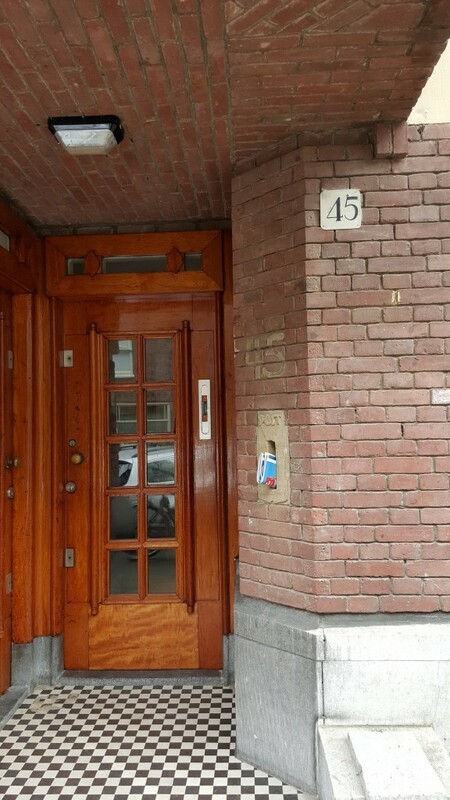 A recent trip to Amsterdam offered the opportunity for a visit to the home of my namesake, Elinor Chava Oettinger, and her parents and brother. 45 Michelangelostraat was our destination and on a cloudy afternoon in late March, after a lunchtime concert at the nearby Concert Gebouw, my husband and I mapped out our trail, and pedalled our borrowed bikes along the well-marked bike lanes easily finding our destination. The Oettinger family, Herbert, Betti, Elinor and Ralph, my great uncle, his wife and two children were four of the more than 107,000 Jews deported from Amsterdam June 20, 1943 to Westerbork and in Spring, 1944 to the Terezin Concentration Camp. 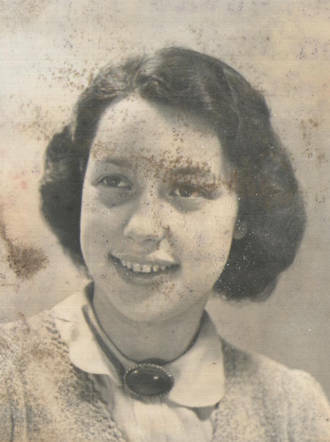 In October, 1944 they were transported by cattle cars to Auschwitz and immediately killed by the Nazis in the infamous gas chambers.My middle name Chava, was Elinor’s Hebrew name, and as the years pass, I often think about her, particularly on Yom Hashoa. I wonder what she was like, and whom she would have become had her life not been so tragically cut short. Like millions of others killed by the Nazis, there is no memorial, no gravestone, for her or her family, and there are no living descendants from this branch of our family. Gunter Demnig, a German artist created the first stolpersteins in the last decade of the twentieth century. Stolpersteins, literally “stumbling stones”, are small brass squares placed in front of houses of the victims of the Nazis during World War II, never to return. These memorials, engraved with names along with date of birth and death, as well as place of death, are the only memorials for many who perished at the hands of the Nazis, including the millions of Jews. These stones bear silent testimony to lives cut short and families stunted. 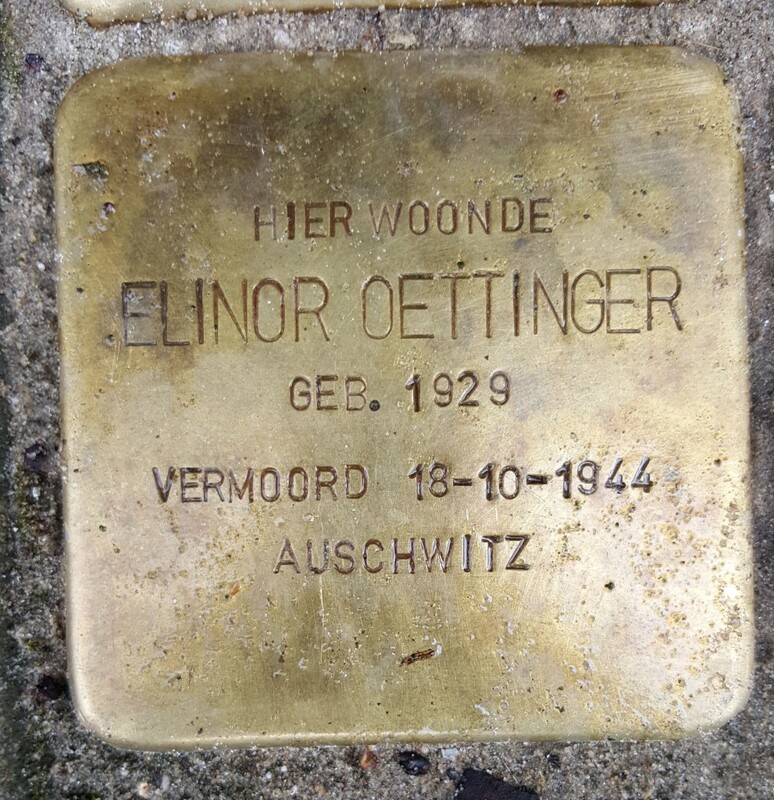 According to the artist Deming, a stolperstein would symbolically return the victim to their neighbourhood so many years after being so cruelly deported and killed. The stolpersteins are a sobering witness to once thriving communities, uprooted, displaced and destroyed. Over 50,000 have been placed in eighteen countries throughout Europe and after recently reading about this project, I was eager to pursue the placement of such stones in front of Elinor’s house to commemorate her parents, brother, and herself. I planned to photograph the house and send it out to my relatives to interest them in the project. As we pulled up in front of Number 45, I felt my heart beating faster. Was it fear, excitement, or merely the exertion of the bike ride? I looked at the number, to make sure we had arrived. Stone row houses, typical of Amsterdam, faced each other on the quiet tree lined the street. I pictured my family, the family I never knew opening the door and treading over the threshold with the black and white stone entrance hall. There was a slot with the word “Post” etched above it into the greying stone just to the right of the front door, and I could imagine young Elinor collecting the daily mail. Then I looked down. There they were, winking back at me in the weak March sunlight. 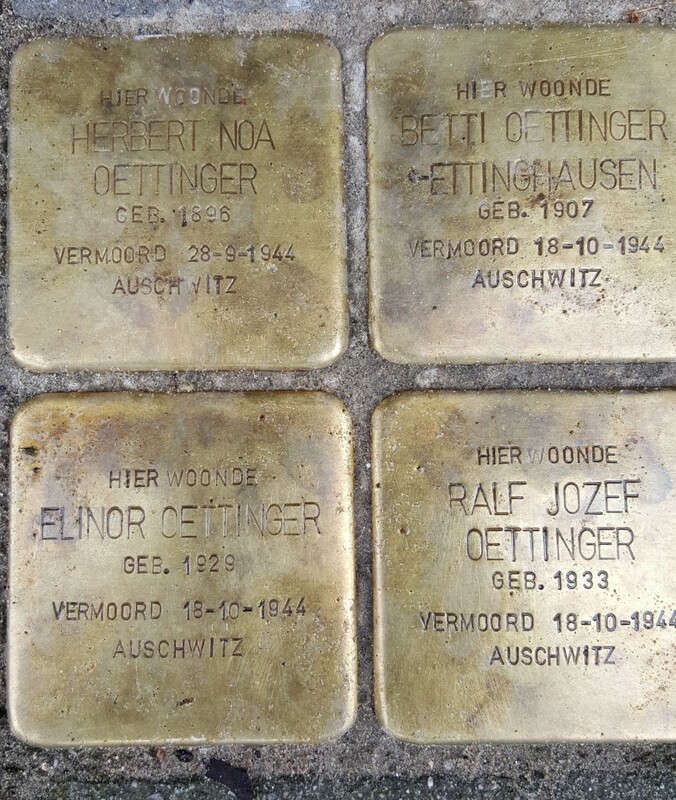 Engraved brass stones with the names: Herbert Noa Oettinger, born, murdered, Auschwitz, Betti Oettinger- Ettinghausen, born, murdered, Auschwitz, Ralph Jozef Oettinger, born, murdered, Auschwitz, and Elinor. There was Elinor. Born 1929. Murdered 18/10/1944. Auschwitz. My eyes teared. The cousin I never knew. A life cut asunder. Fifteen years old. I sat on the stone stoop, and communed with the souls of my relatives who had met their death in such a violent and tragic way. Sending a prayer for their souls. Sending a prayer for ours. Sending a prayer for the people who now live in this house. My husband decided to say Mincha, the afternoon service, at the doorstep, deeming this an appropriate place to talk with God. As I continued my reverie, I noticed a young man pushing a baby carriage, slowing down as he arrived at the stoop where I was sitting. He looked at us quizzically, and I explained that we had come to pay homage to relatives who had lived here, pointing to the stolpersteins. “But how did you know that they lived here?” he said, barely able to stutter the words. I explained that my father had visited here as a youngster, and remembered well both the house and its inhabitants. I asked if he knew about these stolpersteins – when they had been installed, and who had initiated and paid for them. He told me that his parents, the owners of the house, had arranged for the memorial stones, and that they were placed in the pavement just a few months prior. 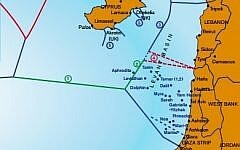 There was an awkward moment between us – the relatives of people wronged in this very spot, and the unrelated individuals who recognized the tragedy, taking of their own time and money to make sure that the injustice was acknowledged. It is hard to say who was more surprised by this chance meeting – him or us. We exchanged e-mails, and asked him to thank his mother for her generous and heart-warming gesture. Interestingly, his beautiful baby is named Rafael, a name close in sound to Ralph, the cousin I never knew, who had also lived here. I wondered about little Rafael’s grandmother, a woman I had never met, a woman totally unconnected to our family who decided to place these stones. Thinking of this righteous woman reminded me of the hundreds of years where Jews found safe haven in Holland, a place where they could pray freely, be proud Jews and find good fellowship with their neighbours. My uncle, Herbert Noa, had moved from Germany to Holland in 1922 for that very reason, to escape the rampant anti-semitism he had experienced in Germany. For most of the more than twenty years he called Amsterdam home it was a welcoming one. We pedalled away, with hearts filled with sadness and pain, anger and gratitude. Sadness over the loss of relatives we never knew, pain remembering the Holocaust and the 107,000 Dutch Jews and the more than 6,000,000 Jews worldwide who lost their lives because they were Jews. Anger at what the Nazis had wrought. And gratitude to the righteous stranger who cared, who made the effort to place these stones, the only physical memorial for my four dear departed relatives, people I have never met, but whom I know, deep deep inside. Naomi L Baum, Ph.D., is an international consultant in the field of psychological management of traumas and disasters with an emphasis on resilience. 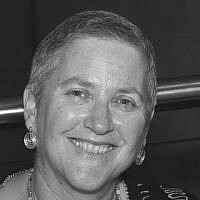 She recently published a book, "Life Unexpected: A Trauma Psychologist Journeys through Breast Cancer." She is the mother of seven and grandmother of 12.